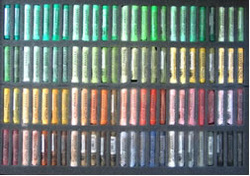 Time to dust off those pastels Most of us have them, some of us use them and nearly all of us would like to know more about them. Yes, it’s the art materials that take pride of place in the neatly selected craft corner we like to escape to, when we have the time! For many of us going about our daily tasks, we often have flashes of inspiration that fires up our artistic nature and stokes the imagination into painting mode. From experience, if this flash isn’t captured on paper – or at least noted down, then it fast fades away to yet another forgotten masterpiece. All artists know too well how an inspired moment can turn blind if action isn’t taken, so over the next few months, I would like to present some ideas, facts and tips to everyone who aspires to picking up a pencil, pastel or paintbrush. With the main focus on pastel, the versatility of this medium can be very forgiving but also frustrating, so let me share with you some of its secrets that have arisen from many commonly made mistakes. The idea is ‘not to give up’. If using pastel chalks for the first time, don’t panic if everything becomes very ‘muddy’ looking. It’s all about the amount of chalk you put on, the quality of the chalks or the texture of the paper. When first picking up pastels it’s so easy to look at all the wonderful shades in the box and pick out the tones that you believe matches the colour of your subject. It is then with great intent, once making your mark on the paper, that an unruly desire to ‘blend’ comes into play. This blending is great for the soul…but not always for the picture. There is a technique to blending that comes with a passion. Blending is like turning your fingers into brushes. You wouldn’t precariously mix all of the colours of an oil painting over a canvas…you would end up with that ‘muddy mess’. The same applies to pastels, be patient with blending, get your colours on, feel the interaction of overlaying colour and let them knit together before you decide how you will blend them. The colour of your paper will also have a significant effect on the overall atmosphere of your painting as unlike paint, pastels rarely cover the whole surface. Depending on the ‘tooth’ of the paper, when chalking you will notice the underlying colour will show through. 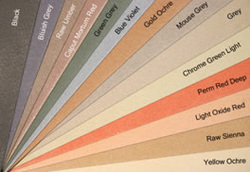 If attempting landscapes or winter scenes, then a pale grey or blue will promote a subdued finish. Deep reds or browns give warmth to your picture that allows highlights of yellow or creams to offer a subtle glow or can give an exciting contrast of tonal value. There are many shades of paper you can choose, from various whites and creams to strong primary colours and browns right through to black. Use of soft and hard pastel chalks and pencils are extremely versatile and can produce some vibrant colours as well as soft and paler tones. Unlike a palette of mixable paints, your colours will be mixed on the paper so a well stocked range of shades will come in handy when you have practiced and gained some experience. To start with though, a basic set of chalks will suffice to getting your inspirations underway, and once confident with your medium, working the chalks and pencils to create fine detail is limited only by your imagination. There are many tried and tested techniques in producing pastel paintings but the one thing to be sure of though is that enthusiasm, guidance and participation in any subject will give you the key to education and success…so get dusting, and good luck!